Remove duplicate songs from your iPod. Is there a better alternative to iPod Duplicates Remover? Is iPod Duplicates Remover really the best app in Music category? Will iPod Duplicates Remover work good on macOS 10.13.4? 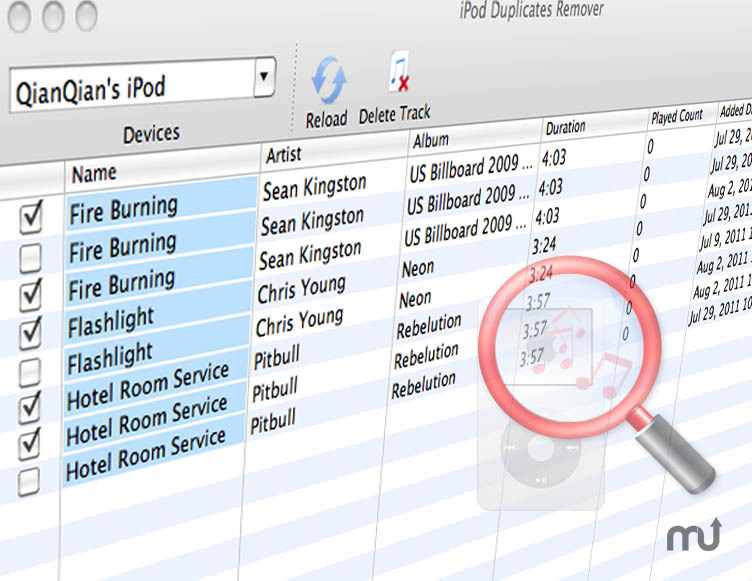 iPod Duplicates Remover manages to remove duplicated songs on iPod devices, so that can save space of iPod to hold more songs. And let you enjoy ipod music playing. Generally, iTunes only copies unique songs to iPod during sync process according to media tag. But if music files have different tag, even they are the same song, iTunes will not know that and will regard them as different songs. This is why sometimes there are duplicated songs on iPod after sync with iTunes. iPod Duplicates Remover works to find out the duplicates and delete them with a simple clicking. iPod Duplicates Remover needs a review. Be the first to review this app and get the discussion started! iPod Duplicates Remover needs a rating. Be the first to rate this app and get the discussion started!